SHE missed most of the inaugural NRL women's premiership with injury and now Sam Bremner will be absent when the Jillaroos take on the Kiwi Ferns in Auckland on Saturday. 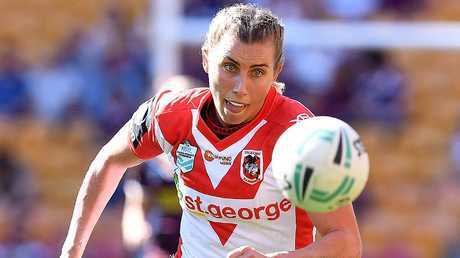 After being named to captain the Australian side, Bremner has been forced onto the sideline with the same toe fracture which ruled her out of two of the St George Illawarra Dragons three NRL premiership games this season. It is a bitter blow for Bremner who has been sidelined repeatedly in the past year or so with various injuries, including a stress fracture which prevented her playing for the Jillaroos at last year's women's world cup. Bremner has been replaced in the trans-Tasman Test side by veteran Karina Brown. "We've got plenty of experienced players in the squad, with many of the team having played the Kiwis on multiple occasions, including Karina," said Jillaroos coach Brad Mr Donald. Sam Bremner in action during the Brisbane Broncos and St George-Illawarra Dragons match. The Jillaroos head across the Tasman on Tuesday to prepare for the match which will be played alongside the Junior Kangaroos and Kangaroos on Saturday.